attending the regular ANZSB conference call meetings as an observer. Some SA ANZSB files have already been made made viewable to Intergroups. Check the “shared with me” tab of your intergroup/group Googledrive. These files or folders of files can then be incorporated into the intergroup/group Googledrive structure. Contact the ANZSB by email sa.aust.mb@gmail.com for more information. 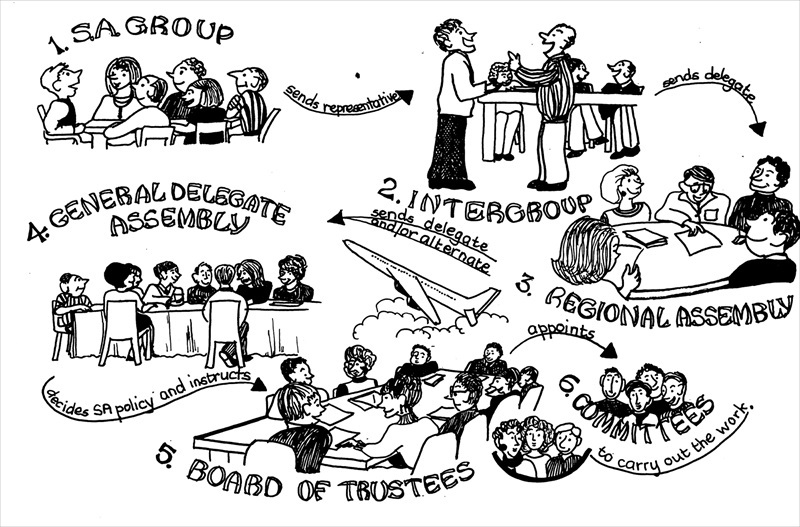 The Australian and New Zealand Service Board (ANZSB) acts very much like a Regional Assembly (see below) with representatives from Intergroups. There are not yet enough groups to create a ANZ Region and send a Delegate to the General Delegates Assembly, the international fellowship-wide policy making body.